If you travel down I-65 in Kentucky and hang a left, you will find yourself in a vortex time machine that transports you to a European country track. Or, you could be making your way to the one-of-a-kind Kentucky Downs located in Franklin, Kentucky. As you drive past a few truck stops, and many BBQ joints, you will find yourself heading toward the Tennessee line. But right before you break the mark, you will make a gentle turn toward a colonial mansion style building. This isn’t the movie set of “Gone With the Wind,” but it surely could be a quick stand in if needed. You will be greeted by some of the friendliest people in the state, and treated to a day that will keep a smile on your face for the long ride home. Once known as “Dueling Grounds,” the undulating track is filled with history and mystery. At various points during the 19th century, gentlemen from Tennessee would travel to the north – to property just across the Kentucky border­­­ – to settle their differences in a pistol duel. At that time, dueling to resolve arguments or conflicts was illegal in Tennessee, but was a lawful activity in Kentucky. According to historical accounts, famous figures such as Andrew Jackson and Sam Houston were said to have visited the “dueling grounds” site as witnesses to such duels. I had the opportunity to work there as Turfway and Churchill Downs had purchased the once shuttered Dueling Grounds. In a few days, we had the plant open for simulcasting and dining. The old saying of “build it and they will come” holds true. But in this case, it was just dust off the place and open the doors as players from surrounding areas made their way back. They were happy to have the jewel of Kentucky turf racing back in action. The facility is one-of-a-kind, and the grounds have a unique glow. It was about this time I was informed by the staff that the building was haunted. Not one to believe the ghost theory, I just laughed and asked where the suspected hauntings took place. When they quietly told me there were noises and happenings on the second floor. I began to have trickle of sweat bead down the back of my neck. That just happened to be the place where my office was located, and it was the only occupied space on that floor… Well, I didn’t hear any ghostly groans or howling spirits, but there were some loud shouts that came from my office. But that was due to a bad beat in an evening race at the Meadowlands. The place is chock full of history and great people. If you need another track to add to your bucket list this is definitely one for the sheet. Founded in 1820 and named in honor of Benjamin Franklin, the city is the county seat for Simpson County in south central Kentucky. The vision came to life when a 1 and 5/16 mile race course and a colonial-style clubhouse opened for business on April 22, 1990. The race track was named Dueling Grounds in recognition of the colorful history associated with the property. But since then, it has changed ownership and taken on a new name. 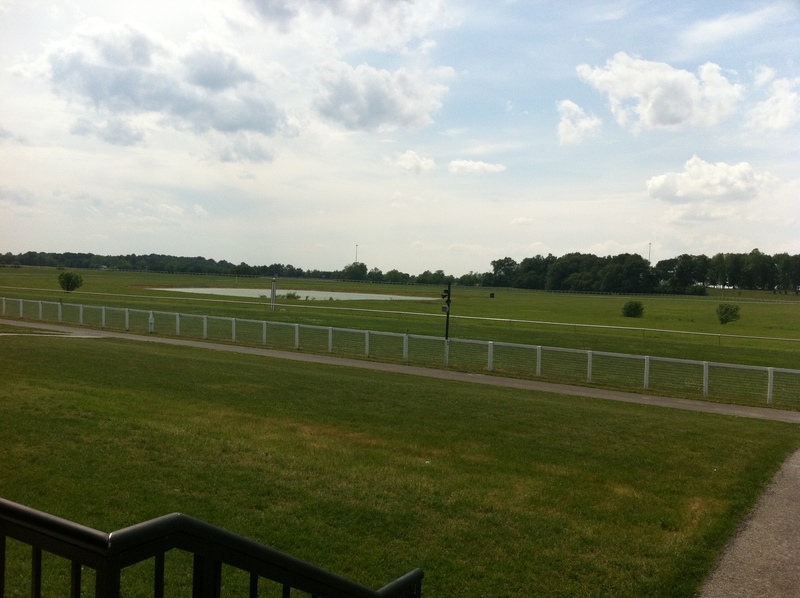 The undulating turf course is well manicured and perfect, and the facility offers Instant Racing gaming and since 1998, Kentucky Downs has hosted charitable gaming operations for important community organizations in the Franklin-Simpson County area. It has the charm of country fair, and the exciting racing action is chock full of races with over a million dollar purse structure. There will be three stakes worth over $150,000, and the rider and trainer colony is sure to take attention. For five days the track comes alive as “Brigadoon” and the action is non-stop. It begins on 9/7/13, and you won’t want to miss a single race!